Absolute Soul Secrets was founded in 2000 by Rose Smith, after having a dream wherein Archangel Michael wrote the name on her forehead while she slept. Archangel Michael told her that it was her life purpose to help people, and to share guidance and spiritual awareness to as many people she could reach possible. Gifted with profound psychic abilities herself, Rose began providing phone psychic readings as a sole operator, literally from a small office in her house. Fast forward to today, and Rose is proud to say that we now have over 60 diversely talented and highly skilled psychics including Clairvoyants, Mediums, Channellers, Astrologers, Crystal Ball Scryers, Dream Interpreters, Tarot Card Readers and Spiritual Healers reading for Absolute Soul Secrets. A family-owned business, Rose and her support team take the time to get to know our psychics. All our phone psychics are closely screened for accuracy, compassion and psychic skills and all our psychics take this important spiritual work very seriously. They are master psychics who are consummate professionals in their chosen field, and are ready to help you with problems that may be causing you sleepless nights and anxious days. 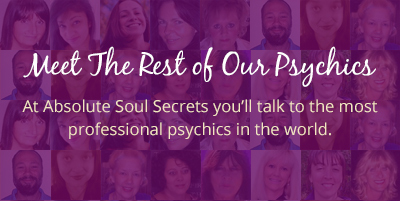 For more than 15 years now, our psychics at Absolute Soul Secrets have helped bring peace of mind to many thousands of people including celebrities, entertainers, executives, business owners and entrepreneurs, right through to mums and dads all over the world. We are committed to delivering a continued service of high quality and integrity to enhance the psychic reading experience for our valued customers. Connect with us today and learn more about spiritual awareness by visiting any of our social media pages below.